The Christmas season is our favourite time of year. Jae’s birthday is on 10th December, then it’s Christmas Day when we go down to Brighton beach to eat chocolate oranges. And then on the 27th it’s El’s birthday! The only trouble with Christmas is that once it’s over you have to wait a whole year for it to come around again. 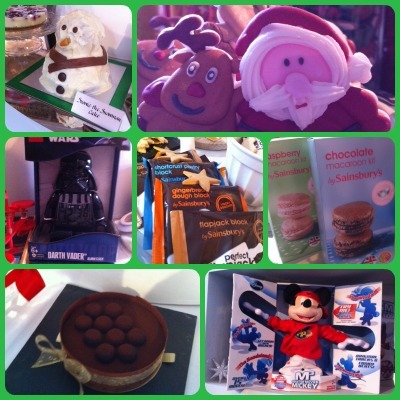 Last week we went to a bunch of Christmas previews, where companies show off all their Christmas treats. It was kind of a weird thing to do on a Summer day but good fun. First of all we went to Sainsburys. There were lots of food bits, little hampers of cheeses and stuff like that but we sniffed the air and pounced on the CHOCOLATE! Daintily naturally. We had a reputation to upheld. El particularly liked the chocolate covered pretzels which were situated near some sweet apple and cinnamon popcorn (also scrummy). There was cake in the shape of a snowman, called Snowie, salted caramel cream, mistletoe shaped sprinkles, macaroon making kits, and even one of those make your own gingerbread house kits. But it wasn’t all about the food. We had a nosey round the gift section and spotted a Lego Darth Vader alarm clock, some Lego bag tags (not a great gift in El’s opinion, what child has ever asked Santa for a Lego bag tag?! ), some Pacman themed stuff (Jae was surprised that El knew what pacman was), a new Kung Fu Panda game called Po’s Winter Wonderland (prompting giggles from El as a po is also a kind of chamber pot), a Master Moves Mickey Mouse (with over 15 moves in his repertoire), really the list goes on and on. Then we went to Thorntons. 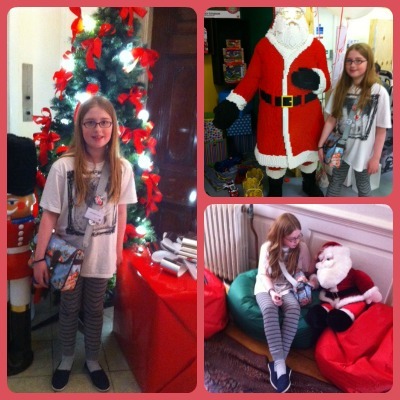 There were three rooms full of as much chocolate as you could eat, plus a giant chocolate Christmas tree. 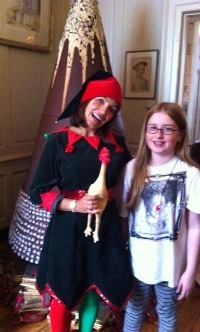 And an elf with a rubber chicken. No, we have no idea either. We met Keith, the Thorntons Master Chocolatier, whose job it is to think up new flavours of chocolate. His job also involves eating a lot of chocolate, about a kilo a day! (We don’t quite belive that he eats that much as he is a slim man.) What a dream job. He let us interview him and Jae asked him serious questions. El asked him if he prefered white, milk or dark chocolate. Milk apparently. Keith says that chocolate changes like fashion – nowadays they have chocolate with salt in which people in the past would’ve thought was bonkers. But we tried some and it was actually quite nice. 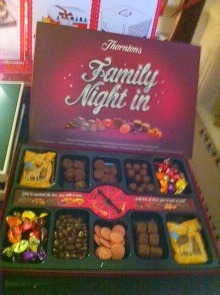 We sampled lots of the new Thorntons range and the one we really liked is the Family Night In, where you have to spin a wheel to decide which choccie you get. Let fate decide! Then we went to Argos, where there were lots of new toys such as Monopoly and Game of Life that you can use with an iPad, and a funny little yellow robotty thing called My Keepon which El was totally hypnotised by. 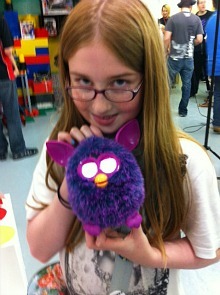 And of course the newly relaunched Furby, which has eyes that can see into your soul. Emma Bunton of the Spice Girls was launching her new range of clothes for little kids. They were all really cute and not all pinky. So that was our fun day of Christmas in July. Only trouble is, now we are impatient to see Father Christmas again! July 28, 2012. Tags: Argos, Christmas, July, Sainsburys, Thorntons. Reviews, Stuff we love. 2 comments.